Seniors and their families can start filling out the FAFSA (Free Application for Federal Student Aid) form starting January 1st of Senior year. Prior to that date, one can look at the site and create a PIN for both parent and child that each will use to sign the FAFSA upon completion. After the 1st, appointments can be set up with your Counselor if you and your family would like some guidance on filling out this, at times, confusing document. After the FAFSA is filled out and sent off to the Federal Government, what you will receive back in about 4-6 weeks is your Student Aid Report (SAR), which will outline what your child will receive in scholarships, grants and loans from each college to which he/she has applied. Scholarships and grants do not need to be paid back. Loans, on the other hand, do need to be paid back, but loans from the Federal Government don't need to be paid back until the student has been out of college for six months. If you have questions about individual aid packages, please contact the Financial Aid Office at that particular college. 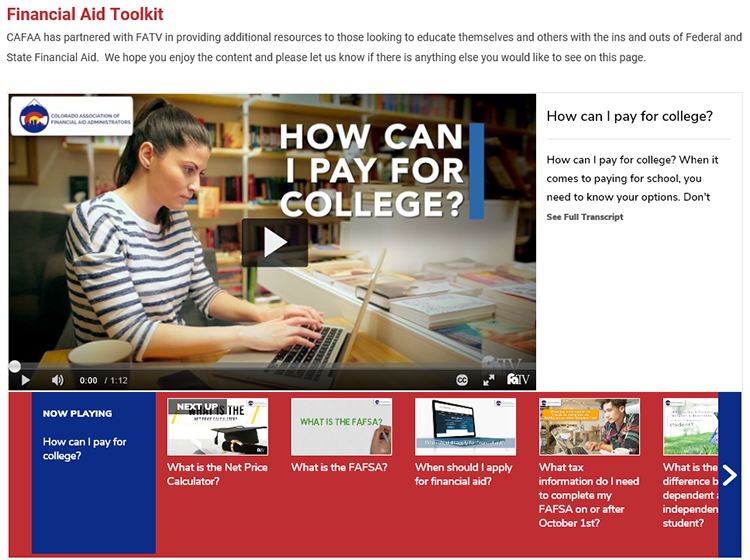 To find links for FAFSA and COF, see the links bar on the right hand side of this page. For information on Available National Scholarships, please see the links at the bottom of the page.